Pudget: Losing Weight On a Budget! : Wanchai Ferry Review And Giveaway!!! Wanchai Ferry sent me one of their new frozen Asian entrees to try. I chose the Beef and Broccolli entree. Of course I was skeptical as I am of all frozen meals. When I opened up the bag I was happy to see that it wasn't just beef and broccoli. It also had red peppers, water chestnuts (one of my favorites), rice and a nice thick brown sauce. I was very impressed with how easy this meal was to cook. It took just a few minutes and only one pan. Less dishes to wash is always good. After cooking the meat and veggies on the stove I then cooked the rice in the microwave for three minutes. Then I separated it onto two plates. It came out to be approximately 1/2 cup of rice and approximately 1 cup of meat and veggies. You can see it was a nice amount in the picture below. I'm sure my husband would eat about twice that amount but for me it was absolutely perfect. When I tried the Wanchai Frozen entree I was stunned. 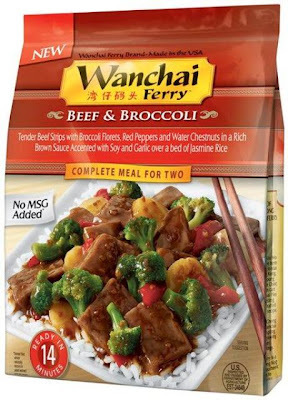 This may just be the best Beef and Broccolli I have ever eaten. Wow, It was amazing! I am very picky about my frozen food and I'm telling you it is awesome! Each package is two servings. Each serving has 390 Calories, 6 Grams of fat and 3 grams of Fiber. I think that is great. What's better then an awesome easy to make meal??? A FREE Awesome easy to make meal!!!! That's right! We have another great giveaway! Wanchai Ferry is giving one lucky winner a prize pack just like I received. 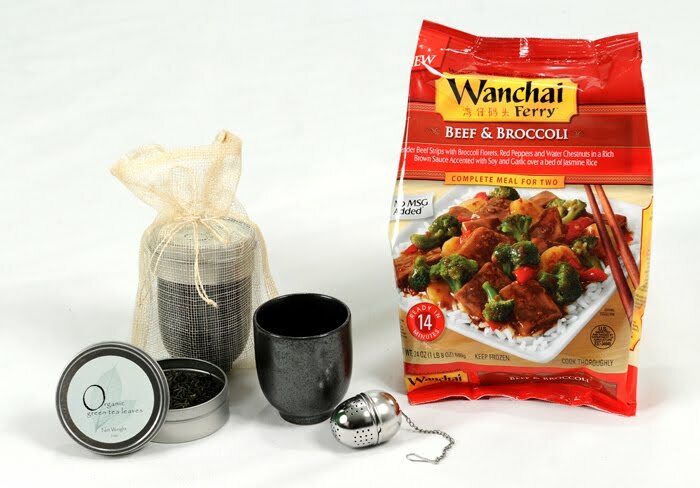 You will receive two tea sets and one coupon for a Free wanchai Ferry meal. You can see the prize pack below. The tea cups are beautiful! There Are Four Ways To Enter to win the Wanchai Ferry Gift Pack: List all entries as separate comments. 1. Leave a comment letting Wanchai Ferry know what kind of Asian meal you would like see them make. Winner will be chosen using a random number generator. All entries must be received by Wednesday July 14, 2010 at 11:59 CST. The winner will be announced Thursday, July 15, 2010. This frozen sample, prize pack, information and additional prize pack to give away were all given to me by Wanchai Ferry. I love their boxed Sweet and Sour chicken. They give you an amazing seasoned powder to coat the chicken with.... yumm!!! I would like to try Chicken and Broccoli. I would love to see some soups! Their stuff is great, and I love Asian soups. I'd like to see dumpling meals. I'd like to see some Korean food! How bout some Japchae!! I'm pretty sure this won't make it onto the shelves, though! Oh well! I would love to see Orange steak. Their Orange chicken is just wonderful. They had me hooked with good coupons and now I am just hooked. Not sure if they already have it, but I would love an easy way to enjoy Kung Pao Chicken at home. I'd like to see Pepper Steak as part of the Wanchai Ferry lineup :) *Thanks* for the giveaway! I would like to see general pso's chicken!